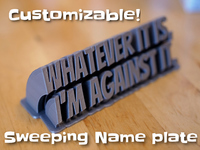 Sweeping name plate by makkuro is licensed under the Creative Commons - Attribution - Share Alike license. A name plate, sweeping around in a circle. Customize it to show your name or text. pyramid text, name plate, Customizable text box with lid and round text. Updated Version D: New customizer functions are used: Now several high quality fonts are available to choose from. You can get an overview of all available fonts on the Google Fonts page. The font list is from wstein, thanks!